Shamina Singh is the executive vice president of sustainability at Mastercard and president of the Mastercard Center for Inclusive Growth. In this role, she is responsible for advancing equitable economic growth and financial inclusion around the world. Previously, Singh was Mastercard’s global director of government services and solutions, where she worked to digitize social subsidy programs in more than 40 countries. In 2015, she was appointed by the U.S. President and confirmed by the U.S. Senate to a six-year term to the board of the Corporation for National and Community Service. Prior to joining Mastercard, Singh led government and public affairs for Nike and spent five years with Citi’s Global Community Development Group. 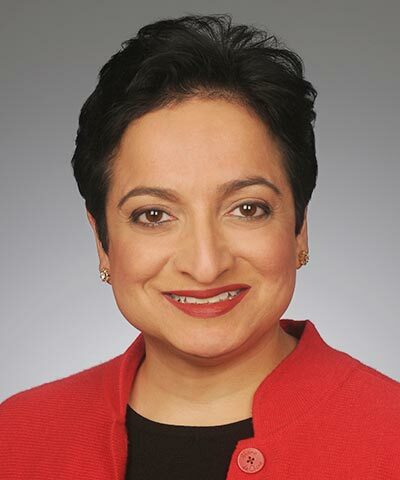 Over a 15-year career in the public sector, Singh has held senior positions in the White House and the U.S. House of Representatives.